and from there on, they would go for a safer place. 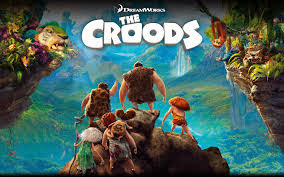 Review: Movie was fast paced with a enough humor, shows how human beings used to get ideas like fire, shoes while struggling to survive in the stone-age. The grandma character brings laughs with her punches to his son. + Points : Storyline,Grandma character. Games based on the film were available in Android and IOS platforms. Dreamworks has announced sequel. Bottom Line: Croods too have brains.